I found myself riding home last night in some pretty crappy weather. I hadn't set out to ride in snowy, slippery conditions, but it happened. My ride home from Andersonville to Logan Square was, thankfully, uneventful. This being the first real snow of the season, I was reminded of some basic but important winter riding techniques to keep the rubber side down. I was riding a Surly Long Haul Trucker with 26" x 1.75" Schwalbe Marathon tires. Usually I keep them inflated to around 80 psi, but during my ride I found myself slipping on the fresh snow. I pulled to the side of the road and let some air out of them. I don't know how much air pressure I released, but it was enough to allow the tires to compress more against the road but not so much so as to run the risk of getting a pinch flat or having the tires come off of the rims. This roadside fix provided a lot more grip. 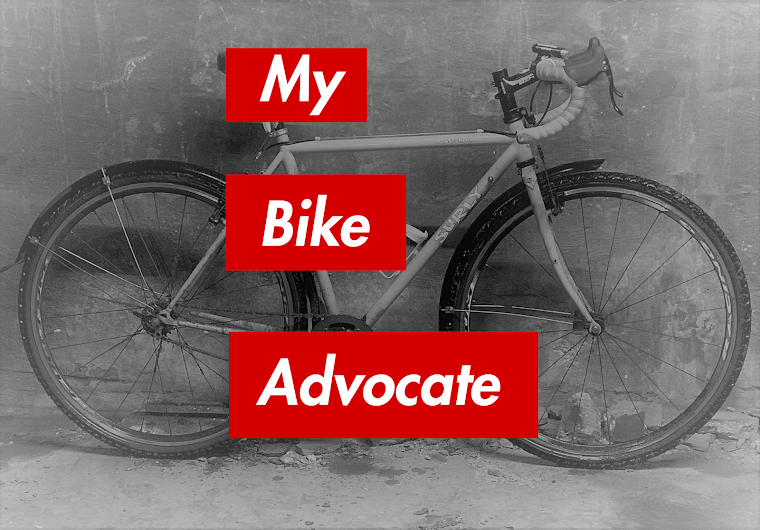 I was also riding, as I always do, with a bright white light on the front of my bike (as is required by Illinois law) and a good deal of red reflective tape on the rear of my bike (also required by law). Additionally, I had a bright red blinking tail light on the rear. This is not required by law but is a damn good idea. My tires also had reflective sidewalls which increased my visibility from the side. Remember, the key to safe riding in dark and inclement weather is to increase your visibility. A driver that can see you will avoid you. Taking more of the lane, moving farther to the left in snowy conditions, is permitted by law. While both Illinois law and Chicago ordinance generally require cyclists to ride to the right, they are only required to ride as far to the right as is safe and practicable. Cyclists may move as far into the lane as is necessary to avoid unsafe conditions, including snow and ice. As more drivers pass you your confidence and comfort riding in the motor vehicle lane will increase. I also find that I generally get more comfortable riding in snow as the winter progresses. Riding in the first snow of the year always feels a bit scary to me. But I know from experience that it gets better. Of course there are assholes out there who will buzz you, pass a bit too closely. . .
. . . But, you know, he or she missed me. It is important not to freak out if this happens and swerve right. Doing so increases your chances of slipping and crashing. Even if the driver of the SUV in the video had sideswiped me or nailed me with their mirror I likely would have been thrown to the right where there was plenty of landing space. That of course would have been less than ideal, but still better than slipping and landing in the main traffic lane and in front of a motor vehicle. It should be said that had I paid attention to the weather forecast I might have avoided riding last night. But when caught by the weather it is important to remember safe techniques and practices for an uneventful ride.